Julia and Colin welcome you to the Toledo Hotel. Are you visiting Blackpool to watch your football team win at Bloomfield Road? You can enjoy watching your team celebrate another deserving Blackpool victory for a whole weekend , bring the family too. 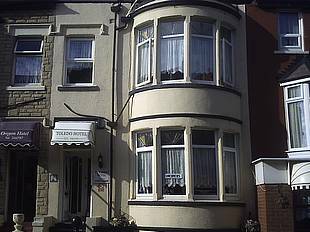 We are ideally situated between the Promenade and Blackpool Football Club, literally 250 yards from the seafront and 150 yards to Bloomfield Road. The Toledo Hotel is open throughout the year and the owners are committed to providing guests with a home from home environment. 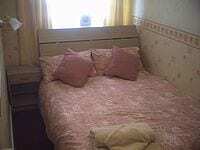 We are located a stones throw from the famous Pleasure Beach and Sandcastle Waterworld. Blackpools popular nightclubs are situated close by amongst many of Blackpool’s fantastic attractions. We gladly accept bookings for couples, families, groups and contractors. Our comfortable lounge area is a great place to start your night out. We have a pool table, karaoke machine and touch screen gaming machines. Our bar serves a variety of quality beers, wines and spirits to try and enjoy to your hearts delight. Should you be coming to Blackpool to take a glimpse of the popular bars on the strip, relax at the Toledo Hotel where we will be only to happy to serve you a freshly home cooked full English breakfast between 9:00 – 9:30am. 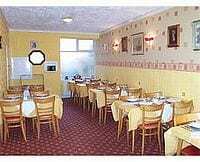 We will gladly cater for any special dietary requirements when given prior notice of your stay. If you require any details regarding a booking or hotel information, please do not hesitate to contact Julia and Colin using any of the methods shown on this page. We endeavour to reply to any emails or form queries as quickly as possible. Place Categories: Central Pier, Central Pier Couples, Central Pier Groups, South Pier, South Pier Couples and South Pier Groups.